After 40 years in the bakery business, Dufflet Pastries' name is now synonymous with delicious and creative desserts and cakes in Toronto. The reputable bakery now boasts three retail cafés and a wholesale division that supplies over 500 restaurants, cafés, hotels, caterers, grocers and specialty gourmet shops throughout North America. 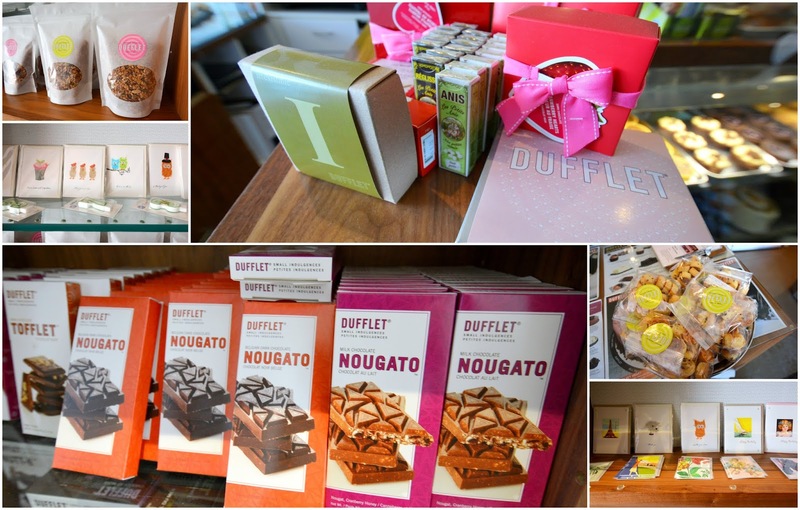 Using only premium ingredients, with no hydrogenated fats or oils, no artificial flavours, colours or preservatives, each Dufflet (Twitter: @dufflet, Facebook: Dufflet Pastries) product is handcrafted from scratch, never made from a mix. I must say, this is all very impressive! Speaking of being impressed, I had the opportunity to try some of their gluten-free chocolate fudge tarts back in September (the Dufflet Gluten-Free line was a finalist for the 2013 SIAL Innovation Award). I mentioned in the blog post that I'm always skeptical about gluten-free products (in that they won't taste as good as the original version) but I was completely blown away by those Dufflet tarts! They were rich and decadent, and never in a million years would I have guessed they were gluten-free. 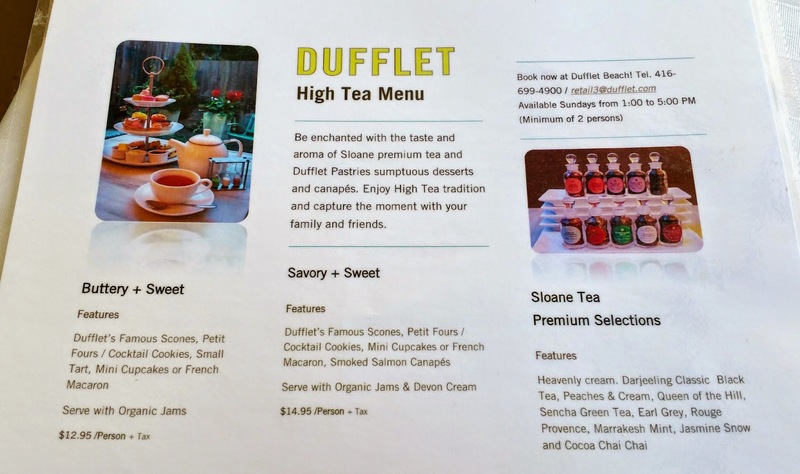 I was invited by Dufflet recently to try their High Tea. Available every Sunday from 1PM to 5PM exclusively at the Dufflet beach location (Facebook: Dufflet Beach), guests can enjoy a selection of sumptuous desserts and canapés from Dufflet Pastries paired with a premium selection of Sloane Teas. This 24-seat café is open seven days a week and offers a wide selection of signature cakes, pastries, pies, cookies, as well as light lunches and specialty beverages for eat-in or take-out. They also have a lot of cute greeting cards, gourmet candy and chocolates for sale at the café. This bright and intimate room at the back is perfect for a relaxing afternoon of tea and pastries. There are two High Tea options: Buttery + Sweet ($12.95 pp) and Savory + Sweet ($14.95 pp). I chose Savory + Sweet because I like having some savoury canapés / sandwiches with tea. 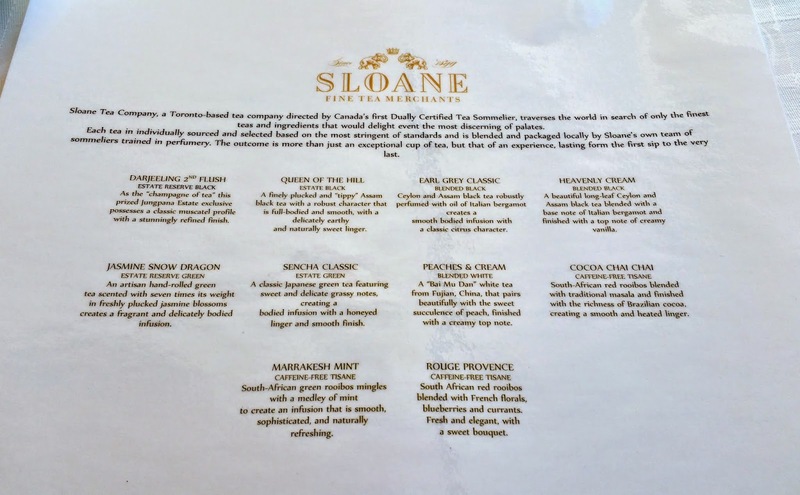 You can choose from a selection of Sloane Teas. All the teas are presented in these little viles so you can take a sniff before making your decision. I opted for the Cocoa Chai Chai, a "South-African red rooibos blended with traditional masala and finished with the richness of Brazilian cocoa, creating a smooth and heated linger". Isn't that the cutest tea timer? My server told me that my tea, because it's a "full tea", needs to be steeped for five minutes in order for the robust spiced notes to come out. Smoked salmon and cucumber sandwiches. Scones served with organic jam and devon cream. A selection of macarons and petit fours. The Cocoa Chai Chai was amazing. After only one sniff from the vile I fell in love. But you know how sometimes things smell better than they taste? Not in this case. The tea was aromatic, rich, and had hints of ginger, clove, cinnamon and chocolate. It was incredibly soothing too. Life would be so sweet if I could have afternoon tea every Sunday at Dufflet. Actually, it's not impossible because it's totally doable. At a very reasonable price of $12.95 / $14.95 per person (depending on the option) most people can afford to experience afternoon tea here. Given, the high tea at Dufflet is not as fancy as say, afternoon tea at Windsor Arms with their plush seats, prosecco option, and intricate finger sandwiches and tarts, but there's absolutely no way I can afford to spend $45 on afternoon tea every Sunday here...or even once a month, to be honest. 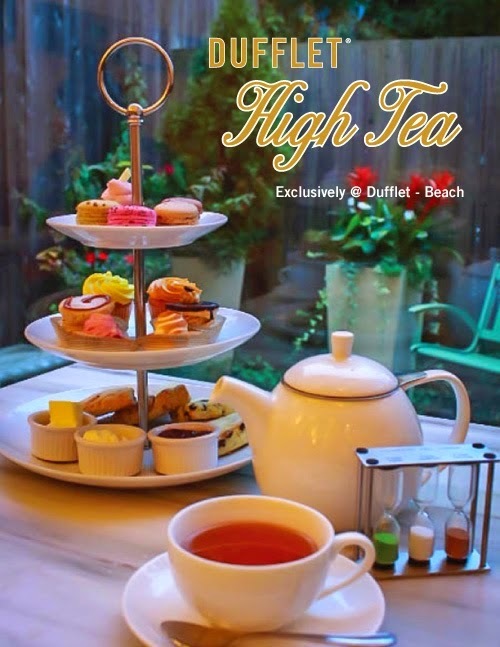 At one-third of the price, Dufflet's High Tea on Sundays is a fantastic option for specialty teas and delectable pastries. 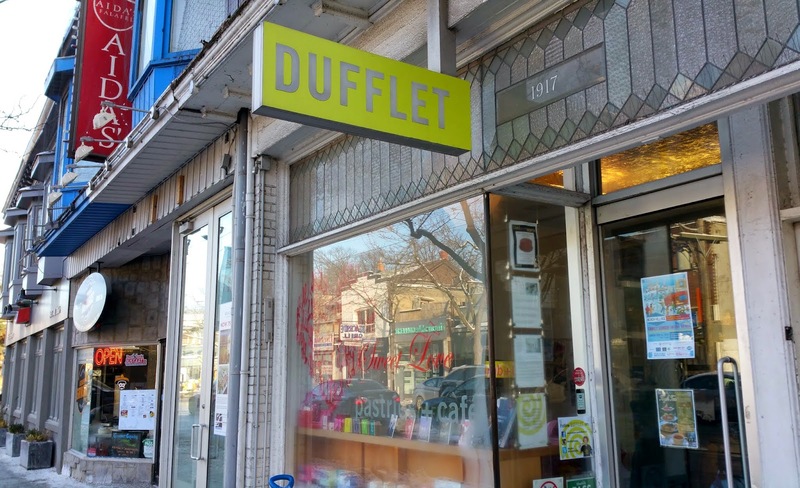 Dufflet accepts reservations via phone, 416.699.4900, or email retail3@dufflet.com. Minimum of 2 persons per high tea booking.